Ai shore it went in heer! Muss be a majishun mausee. CongaSoloz, anni! Nao hao duz ai get owtta dis bag? Sumwun holds da buttom sew I kin git sum trak shuns!! silly kitteh. you should not put mousies down and furget about them. Nawt a lyun, but GET IN TEH CAR! Ov corss !! Yoo invites guests for a meal nd it’z bad mannas tu eat tehm !! heers teh burfday fairy to say HAPPEE BURFDAY to Ragz, mtomcsanyi an evreewun else hoo haz a burfday today! i haz bringd yummy fudjy burfday caeks, buttery yello caeks wif creemy frosting, iskreem, fizzy frooty party punch, fansee shiny party hats, an goodie bags filled wif bownsy ballz that lite up wen they bownse, itty bitty sekrit notebuks wif invisiblol ink pens and sekrit decoder mood ringz, kandee, an fuzzy kitteh stikkers wif googly eyes! an a big swish ob teh burfday wand to making all yor burfday wishes come troo! an brite-colurd baloonz wif shiny markers for writing messijes to send to peepls an aminols hoo haz gone on to teh meddow. Happytayle Burfingday tu mtomcsanyi aka Spotstarsmom!! A burfday adn a grate photo adn capshun on teh saem dai! Adn happeebirfdai to awl dose hoo shayr their birfdai todai! HaHAA!!! Happity birfdae tu Ragz adn teh triksie Spotstarmawm anda efurrehwunz wiffie birfiedae tuday!!! Happi burfday to spotstarsmom adn all teh burfday Cheezpeeps!! [dubious] Okay, isle byte. Whut duz yoo seez? Hab summ! Heer ya goe! Maus bee in teh uvver bagge. Teh wun taht skweeks wehn yoo tries to foald it up? Fankew sew much mai frends, it meens sew much tew mii tew hab yore birfday wishes. Speekin ov mowsies! Yestiddy Spot and Ai cawt a mowsie tugevver!!!! Ai whuz bacuumin mai howse an ai had put the bacuum farver daown the hawl wen ai herd a ufny noyse, it whuz Spot playing arownd the bacuum!!! Spot is mortally terrified ov the bacuum sew ai noo sumfin whuz ufny. Ai thot…”Dere can’t bii a mowsie under dere?” Ai lukked but ai cuddin see no mowsie sew ai went bak tew werk. A whylol laytur ai caym owt tew finnish the bacuumin an heer ai am bacuuminm a way an ai lukked daown an dere’s sumfin dangling awf the back ov mai onlee a fyoo munfs old bacuum!!!! Whut the heck is dat? HOLY CRACKERS ITZ A MOWSE!!!! WHAT DO I DO NAO??? Okay, furst breev….neggst open the bak door…den grab a pile ov nappy kins, neggst cayrfully grab mowsie by the taylol…oh pleez let awl the mowsie come owt, oh gud…dere’s awl the mowsie….iz the mowsie hurt bad? Pleez don’t bii really visibly hurt bad den ai will get awl upset and hav tew try tew fix it. 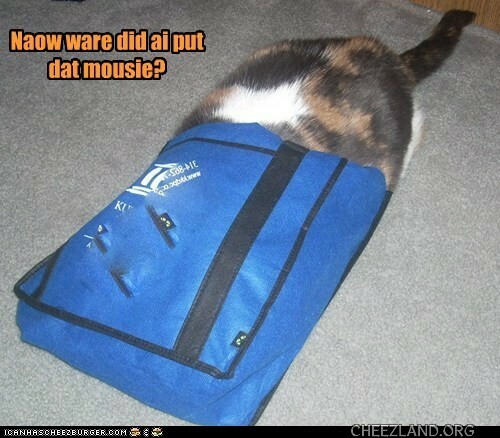 Mowsie don’t luk tew gud but cud jus bii stunned, okay plz mowsie don’t go nuts an try tew byte mii okay? Tayk mowsie owtside and kwikly fling it awf the dek!!!! Bye mowsie….don’t come back, plzkthx! Nuffin but eggscitement heer at the Spot and Star howse!!!! were teh kittehs getting you a mousie as a birfday present? In Cheezland, the time is 05:17.